Massage has been around for thousands of years, in some form or another, as mankind has long intuited the transformative, restorative and healing powers of touch. Think of a mother gently kissing her injured child's boo boo to make it better, or a man rubbing his head after banging it to soothe the pain. It feels good to be touched, especially when we are injured or stressed. Alleviates low back back and improves range of motion. Enhance immunity by stimulating lymph flow--the body's natural defense system. Help athletes of any level prepare for, and recover from, strenuous training sessions. Therefore, whether you are a weekend warrior, NFL superstar, or just want to play with your children or grandchildren, massage therapy can help you do it better. So, what are you waiting for? Book your massage today and start getting all of these benefits now. To book with one of the best therapists in the country, Brian Riley, check out Brian's website, www.brlmt.com. For more massage options globally, email us at info@bobwellsfitness.com or contact your local spa. There is no question that a proper resistance training program will help us achieve incredible results: we will perform better on the fields and in the gym, and we will look better on the beach and in our bedrooms. However, most people's workouts are poorly designed and are thus inefficient, and ineffective. We need our workouts to be challenging, yet varying in intensity and exercise selection. These proper progressions will ensure our continued growth and eliminate stagnation and overtraining. The first workout is a kettlebell workout with Nealey Wallis, a former diver at NYU. The second workout is Wallis' ViPR workout, and the third workout is a TRX workout from one of the top trainers at Equinox, Karolina Pawlak. Check out the Bob Wells Fitness YouTube channel for more workout videos, or email us at info@bobwellsfitness.com to design an individualized training program for you. The great Benjamin Franklin famously said, "If you fail to plan, you are planning to fail." These words highlight a fundamental truth about the need to plan. From fitness to travel to work, this aphorism rings true: in order to ultimately be successful with anything, we must have a plan and manage our time wisely. Carry a schedule and record all of your thoughts, conversations, and activities each week. This will give you an accurate account of how much you can get done during the week, as well as how much time is wasted via unproductive actions, thoughts, and activities. Assign a time to any activity or conversation that is important to your success. Set appointments with yourself and create time for high-priority thoughts, conversations, and actions. Stay disciplined and keep these appointments. Spend at least half of your time on the thoughts, activities, and conversations that produce most of your results. Spend the first 30 minutes of each day planning your day. It is crucial not to begin your day until you complete your time plan, since this is the most important time of your day. Take five minutes before every task to decide what result you aim to achieve. This will allow you to define success before you begin. Spend five minutes after each task to determine whether or not the desired result was achieved. If not, troubleshoot how to achieve success with the next task. Put up a "Do not disturb" sign when you have to get work done. Practice not immediately answering the phone or emails. Don't immediately give people your attention, unless it is absolutely crucial to immediately offer a response. Instead, schedule blocks of time to answer emails and return phone calls. Block out social media distractions, such as Instagram, Twitter, and Facebook unless you are using these tools to generate business at the time. Remember that it is impossible to get everything done. 20 percent of your thoughts, conversations, and activities are likely to produce 80% of your results. By implementing these proven time management strategies, you can remove any self-limitation or self-sabotage you have around "not having enough time," or today not being "the right time" to start on your next journey, fitness or otherwise. Cardio, or cardiovascular training is an important part of any training program. Whether the primary focus is to improve athletic performance or to look and/or feel better, cardio is key to this success. However, to many of us, cardio conjures of images of that boring thing you do on the treadmill, elliptical, or exercise bike. Too often we turn on the television, grab a book, or listen to the music flavor of the day on our iPhones or iPods. We zone out as we try to get in the fat burning zone. This method of doing "cardio" is the surest way of ensuring boredom, but more importantly, it doesn't work to improve performance or looks. Like other aspects of a proper training program, the cardio portion has to make sense and fit into the overall goals of the training program. One effective, and efficient method to properly incorporate cardio training, is to use high intensity interval training, or HIIT for short. HIIT is done by alternating between work phases and active recovery phases. 1. Start with a 5 minute warmup. 2. Sprint as fast as you can for 30 seconds. 3. Immediately follow the sprint with a 60 second jog. 4. Finish with a 30 second walk. Complete steps 2-4 for 5 to 15 rounds, depending on your current fitness level. 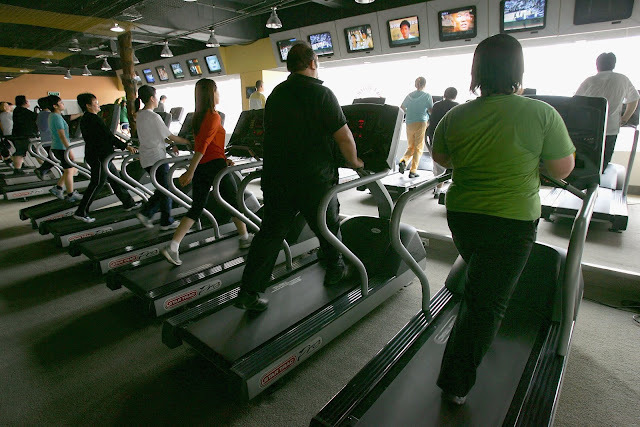 For most people, a cardio session should last for no more than 10-30 minutes. For more information, check out HIIT Your Way to a Leaner Body or email us at info@bobwellsfitness.com and we can customize a training experience guaranteed to help you reach your goals. "Nothing great was ever achieved without hard work." 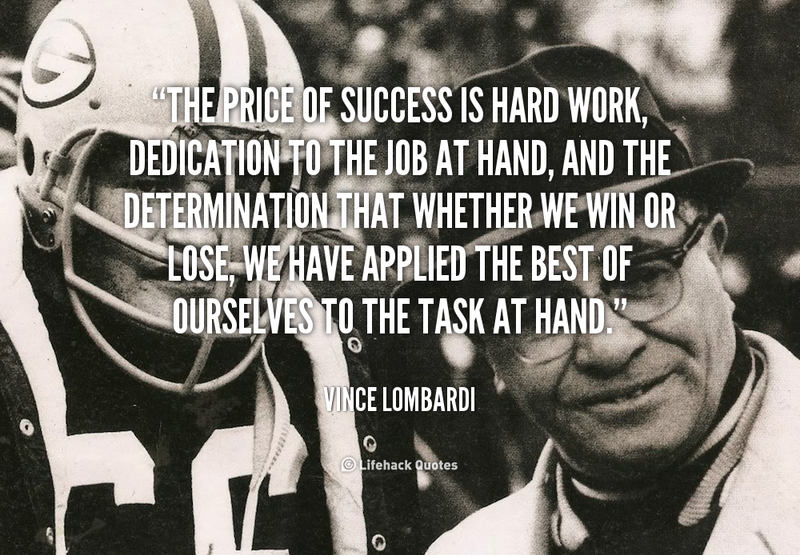 We have all heard this quote, or some variation of it regarding the need to work hard if we wish to be successful in our lives. Quotes like these, and their call for hard work inspire us to persevere at work, in the gym, and on the playing fields. We lionize those who seem to never rest, pushing their minds and bodies to the brink of collapse. We erect statues in their honor and memory, and endlessly recall their admonitions to work increasingly harder. There is no debate about the need to work hard to achieve our fitness goals, such as our dream bodies. However, it should be also noted that nothing great can never be sustained without proper recovery and stress reduction. College football fans surely remember the case of Urban Meyer, whose legendary hard work initially paid off with an average record of 11.4 wins and just 2 losses his first five years at Florida, claiming two national championships in that same span. Stories about Meyer's legendary work ethic grew, as did his mental and physical stress. His last year with the Gators ended with a trip to the emergency room, a 'dismal' 8-5 record, and the beginning of a two year break from coaching to recover from his inordinate amount of stress and hard work. Clearly, hard work has a tipping point, where there is an inverse relationship between it and success. Therefore, we need to recover properly and reduce our stress if we are to achieve even greater successes in the gym, on the playing fields, and in life. 3. Curl up to a good book. Find a quiet spot to read for 30-60 minutes each day. Check out "Strategies for getting control of stress" for additional ways to relieve stress and recover properly. Remember that rest/recovery is as important as the hard work that you are doing to achieve your goals. When it comes to nutrition, or more specifically good nutrition, many of us conjure up notions of restrictive diets, counting calories, and forswearing our favorite aperitifs. Everywhere we turn, the latest health and fitness magazines and blogs, our family, friends, trainers, or the random yenta at the grocery store has the perfect diet for us. We are told to "eat this, not that" and sit back as the pounds melt away. We will try anything to feel better, to look better naked. Atkins, Zone, veganism, paleo, and pescetarianism are just some of the myriad diet options that abound. 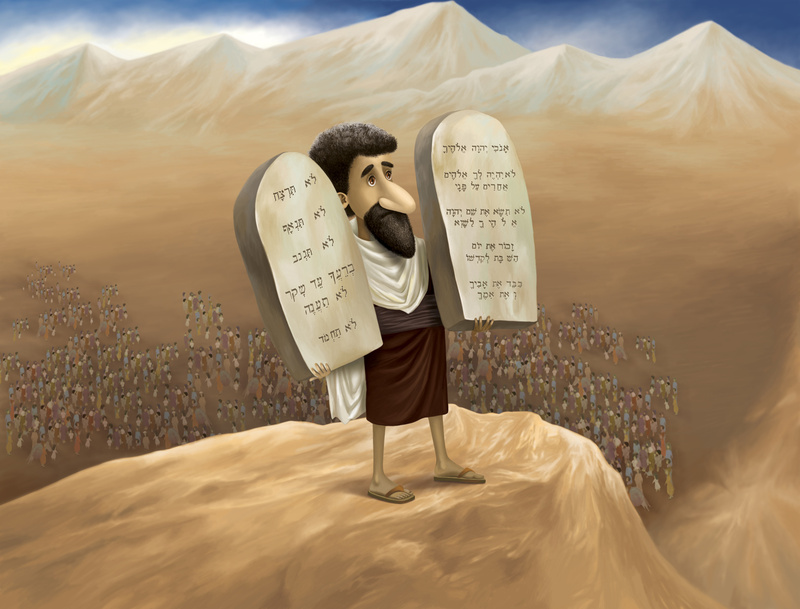 Some options require us to confront complex moral issues, such as dealing with meat and fish consumption. Others simply require us to be math wizards, calculating our caloric intake and expenditure during various activities with the mental dexterity of Alan Turing or Leonhard Euler. So we try one or more, but inevitably, and rather quickly, we put back on the pounds that we previously lost. We end up frustrated by our inability to keep off weight permanently. We cycle back to defeatist mindsets and unsustainable diets, as our weight yo yos. We can stop this vicious cycle with a sensible diet that works and that we can sustain long term. 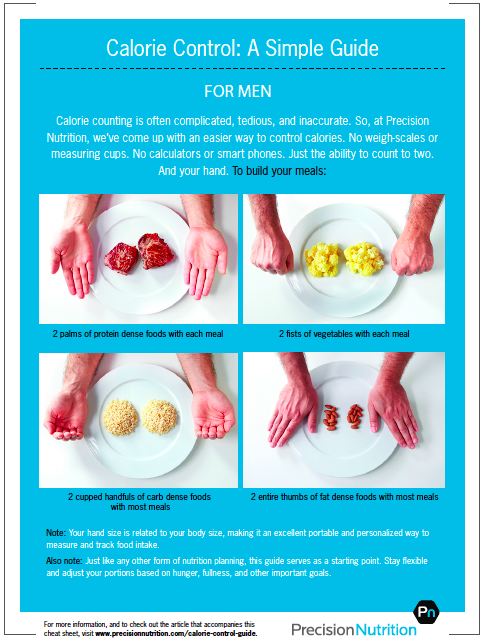 Precision Nutrition has a great hand based diet that does both. 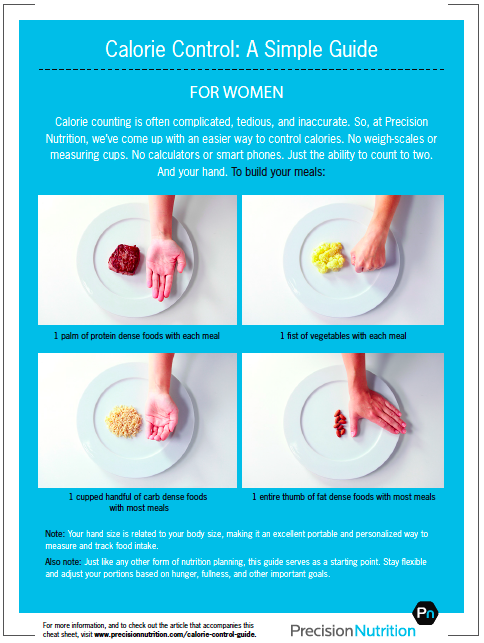 Instead of fastidiously counting calories, we use our hands to measure the food portions. The charts below are a guideline to help you regain your sanity, and get your dream body--for summer and beyond. Spring is upon us, and that means that summer is quickly approaching. For most people, summer means things like time off from work, weekend trips to the beach, vacations with families, and weddings. We cherish, and subsequently, chronicle these moments to share with family and friends--to have reminders of life's magical moments and journeys that make us happy and inspire us. These experiences open our eyes and minds to a vast array of new experiences, and provide us with memories that last a lifetime. Inevitably, we want to look and feel our best for these momentous occasions. Still, and despite our best intentions, it can be challenging, or down right daunting to know what to do next or where to go for help. The answers to our questions, and the solutions to our health and fitness "problems" are for the most part simple. It is properly implementing these strategies that proves to be the most difficult for most people. Over the next few weeks, we will delve deeper into each one of these points on the star of fitness. 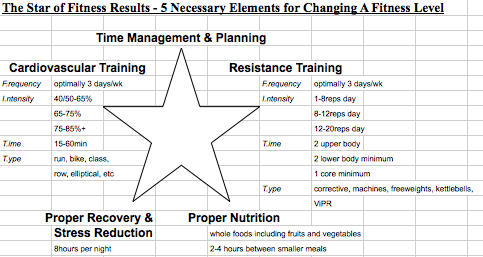 We will also give you easy to implement steps to improve each part of the star and improve your fitness and your life. Here's to the next step, and the new you.